Armenian mythology began with Urartian origins, gradually incorporating Mesopotamian, Iranian, and Greek ideas and deities. There are signs which indicate that the ancient Armenians were initially nature worshipers and that this faith in time was transformed to the worship of national gods, many of which originated in neighboring cultures. The pantheon of Armenian gods (ditsov) formed during the nucleation of the Proto-Armenian tribes that, at the initial stage of their existence, inherited the essential elements of paganism from the Proto-Indo-European tribes that inhabited the Armenian Plateau. Historians distinguish a significant body of Indo-European language used by Armenian pagans as sacred. Original cult worship is a kind of unfathomable higher power or intelligence called Ara, called the physical embodiment of the sun (Arev) worshiped by the ancient Armenians, who called themselves "the children of the sun". Since ancient times, the cult of sun worship occupied a special place in Armenian mythology. Also among the most ancient types of worship of Indo-European roots are the cults of eagles and lions, and the worship of heaven. 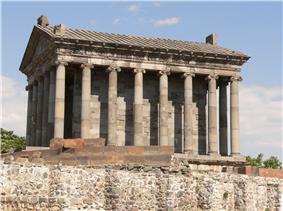 Over time, the Armenian pantheon was updated, and new deities of Armenian and not Aryan origins appeared. Furthermore, the supreme god of the Armenian pantheon, Vanatur, was later replaced by Aramazd. Aramazd was the Parthian form of Ahura Mazda. The latter, though, has appeared under the influence of Zoroastrianism (see Ahura Mazda), but with partially preserved traditional Armenian features. 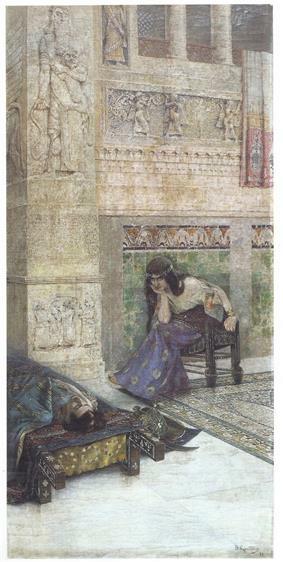 Similarly, the traditional Armenian goddess of fertility, Nar, was replaced by Anahit. Zoroastrianism had a major influence on the Armenians and their mythology. Until the late Parthian period, the Armenian lands were without a doubt predominantly Zoroastrian adhering. Ḫaldi - Chief of the pantheon in its earliest stages. Due to his name becoming a title akin to Baal (i.e. "the Khaldi/Baal of the city", "the Khaldi/Baal of storms"), the chief deity was eventually syncretized or replaced with Ahura Mazda, becoming Aramazd (see below). Formed a triad with his sons Ardinis and Teisheba. Ardinis - Sun god, a son of Ḫaldi, with whom he formed the lead triad of the gods. 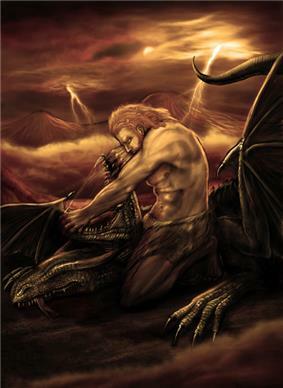 Teisheba - Storm god, a son of Ḫaldi, with whom he formed the lead triad of the gods. Spandaramet - Cognate of the Iranian Spenta Armaiti, a daughter of Aramazd, and cthonic goddess of fertility, vineyards and the underworld. Spandaramet was chosen by translators of some Armenian Bibles to convey the meaning of Διόνυσος) in 2 Maccabees 6:7. Sometimes called Sandaramet or Santamaret denoting a connection to the underworld unique to Armenian theology, even in Christian writings. Tir or Tiur - Cognate to either the Iranian Tir (or Tishtrya) or (via Armenian dpir "scribe") the Babylonian Nabu. In either case, the mercurial god of wisdom, culture, and science; messenger of the gods and psychopomp. Identified with the Greek Apollo. 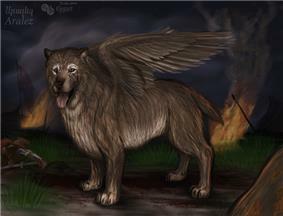 Tir's role as psychopomp may have been absorbed from the Luwian thunder god Tarhunda, whose name had been used to translate that of the Mesopotamian underworld god Nergal. Tir's temple was located near Artashat. Shahapet - The Shahapet were usually friendly guardian spirits who typically appeared in the form of serpents. They inhabited houses, orchards, fields, forests and graveyards, among other places. The Shvaz type was more agriculturally oriented, while the Shvod was a guardian of the home. A Shvod who is well-treated may reward the home's inhabitants with gold, but if mistreated might cause strife and leave. Pahapan Hreshtak - Guardian Angels. Hayk or Haik - Legendary forefather of the Armenian people, who lead a successful rebellion against a Babylonian king named Bel. When Bel and his armies pursued Hayk and his people, Hayk fired an arrow across the battle field, killing Bel and scaring off his forces. Shamiram - The legendary Assyrian queen that waged war to get Ara.